UPDATE: Unfortunately, Houston has had to relocate to Chattanooga, but you can find more information about vegan bakers/bakeries in the post about wedding cakes. For breads and vegan baked goods, try Hillside Bakery. Guys—Knoxville has a vegan baker. First we got a food truck, and now this? #Blessed. As you can see from her Instagram account, CloudWalker Sweets owner Houston Mackenzie makes a wide variety of desserts that are not only delicious, but downright artistic. In addition to offering cakes, cookies, truffles, fudge squares, donuts, tiramisu cups (! ), and more, Houston specializes in raw vegan cakes and cheesecakes—all of which she makes out of her tricked-out home kitchen. She also prides herself on her range of flavors, which includes both classics and new favorites like margarita, chai, matcha, avocado lime, and cookie dough. In her words, "Basically, if you can dream it, I will do it." Since moving to Knoxville from Chattanooga two years ago, Houston has watched the vegan community here grow and expand, which she says has been amazing to see. She points out that while Knoxville has always had an astounding range of small businesses and vegan options at nearly every restaurant she ventured to, we haven't had a straight-up vegan restaurant like Chattanooga does—until the Dinner Bell Fresh food truck, which has become a weekly tradition (in fact, they were the ones who told me to Houston!). To introduce my fellow Knoxville vegans to the person who will be making our birthday cakes and holiday desserts for the foreseeable future, I sat down with Houston Mackenzie at K Brew a few weeks ago. Here's what she has to say! Bonus: Don't miss the end of the post—there's a recipe for lemon blueberry pie. Q: How would you describe your dessert aesthetic? A: Modern meets classic, which is how I would describe my personal style as well! Q: What led you to vegan baking and desserts? A: I've had a sweet tooth my whole life, and enjoyed making my own versions of desserts I had tried. When I made my desserts, both vegans and non-vegans were very kind and gratifying to me. I've always found happiness in baking, but it wasn't until I became completely vegan that I found my true calling. I enjoy the unique ingredients and thought process of vegan baking. Q: How did you come up with the name CloudWalker Sweets? A: A few years back, I stumbled across the Portuguese word nefelibata. It means "cloud walker": one who lives in the clouds of their own imagination, or one who does not obey the conventions of society, literature, or art. It seemed to sum me up in one word, and when I started my vegan baking business in Knoxville, I felt thankful that I finally had a use for this unique and beautiful word. I also don't want to bake just cakes or cupcakes, and I'm very inspired by English "sweet" shops. That's how my name became CloudWalker Sweets! Q: What's your biggest vegan baking "hack"? A: I would have to say any kind of plant-based milk plus apple cider vinegar. It's a great substitute for egg when combined with the baking soda in the dry ingredients for cakes and cupcakes. It leaves them so light and airy. Also, aquafaba—but I think any vegan baker would say that now. Truly revolutionary! Q: What made you decide to start living a vegan lifestyle? A: I began my journey into veganism about 5 years ago by becoming vegan for health reasons. But it wasn't until I watched a video of Gary Yurovsky that was taped during one of his college lectures that I decided to go completely vegan. I also have to attribute my continuing veganism to Phillip Wollen, and Australian philanthropist, vegan, and animal activist. These two men made me come to the conclusion that any and all meat and dairy products are not only bad for our health and bad for our environment, but most importantly, bad for the animals that are abused, neglected, and murdered. I made a choice that has benefited my health both physically and mentally, and vegan baking is one way to share that with other people. Q: What changes have you seen in your life since going vegan? A: My health has drastically improved since I began living a plant-based vegan lifestyle. I rarely get sick, which was a complete turnaround from getting either a cold or the flu once a month. I am so much more active. I definitely believe if I hadn't gone vegan I would still be working a sedentary job and would not be enjoying the beautiful outdoors in Knoxville. My life overall has become more positive now that my outlook on animals has changed. Q: What's your personal favorite dessert? A: Any type of raw dessert, particularly raw cheesecake—it's made mostly of raw nuts (like cashews and almonds) and dates. Q: What's your favorite dessert to make? A: I love making pies! 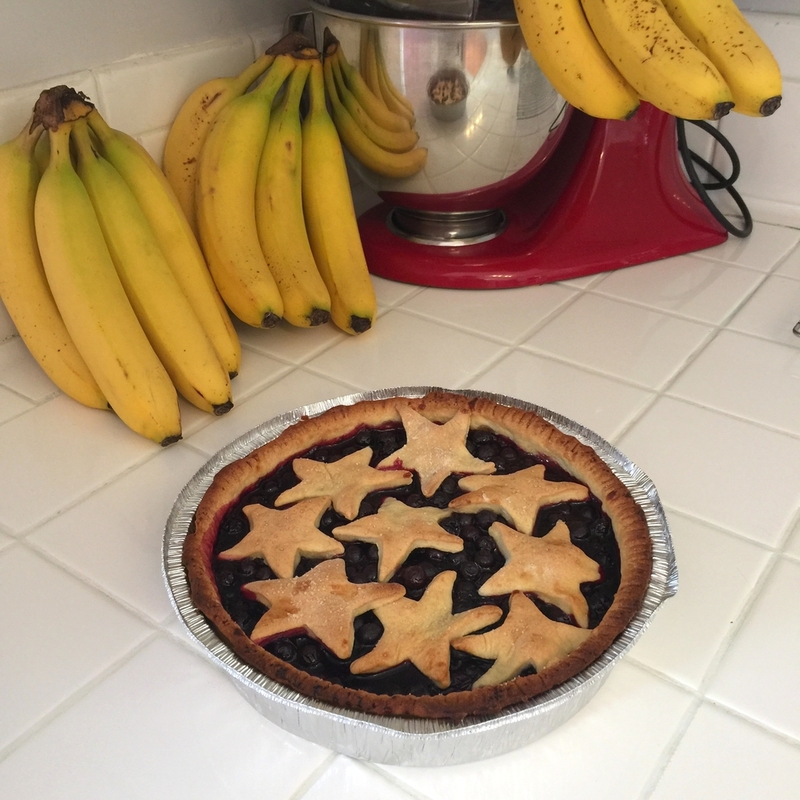 There's an amazing blueberry lemon pie that I make almost every year for the 4th of July. Well, Knox Vegan reader, that pie sounded so delicious that I asked Houston if she would share the recipe with us, and she generously said yes! Here you go—the Zesty Lemon Blueberry Pie from CloudWalker Sweets. If you're not sure you'll have a chance to make one in time for your 4th of July celebration, you can pick one up for just $20! Pretty sweet deal, right? Just send an email to houstonmackenzie@outlook.com to order yours. Thoroughly mix flour, sugar, and salt. Cut butter into small chunks mix into the flour mixture (with a pastry cutter, if you have one) until it has a sandy texture and small clumps begin to form. Mix cold water with vodka and add 2 Tbsp. at a time to the flour mixture until a sturdy yet pliable dough forms; you may not need all of the water and vodka mixture. Divide dough into 2 sections. Wrap each tightly in plastic wrap and refrigerate for 1 hour or overnight. Before you take the dough out of the refrigerator, preheat the oven to 400 F.
When the dough has chilled, take out one section. Roll it out on a floured surface and place into the pie pan. Return the pan to the refrigerator while you mix the pie filling. Rinse and thoroughly dry the blueberries. Mix the berries, sugar, cornstarch, lemon zest, and salt. Drizzle in the lemon juice and mix again. Pour the mixture into the refrigerated pie crust and dot with butter. Return the filled pie to the refrigerator. Roll out the second section of dough. You can use a small cookie cutter to cut shapes (stars are my favorite! ), cut the dough into 1-inch strips for a lattice pattern, or leave it whole and pierce the top to allow steam to escape. The pie will bake for a total of 40 minutes. At the 30-minute mark, check the top crust. If it's already browning, add a layer of aluminum foil over the top, then bake for 10 more minutes. When it's done, pull it out of the oven and place on a cooling rack for 1 hour. Enjoy! If you'd like to subscribe to Knox Vegan or are interested in becoming a guest blogger, just get in touch! Join the club—subscribe to Knox Vegan News!